Those are instructions for ios6 for ios7 the “square/arrow” looks different more of a box with arrow going straight up and it is now at the top of screen to the left of the URL.. 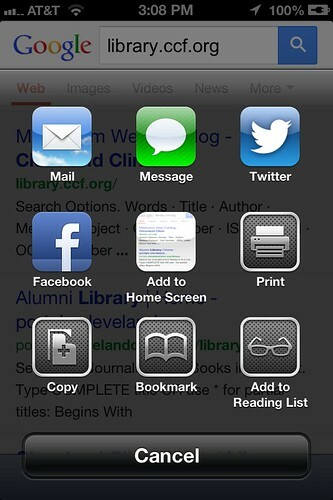 If you are bookmarking a libguide a very nice looking L comes up as the picture. One more thing in terms of the picture/image/icon. Try this out..
Have not tried it yet… But looking into it..
Krafty Librarian this is not an app at all it is really just a bookmark. If your site is not responsive or optimized for a mobile device then the students or residents that want an app will not likely be satisfied with this solution. I totally know this is not an app. I said it wasn’t an app. 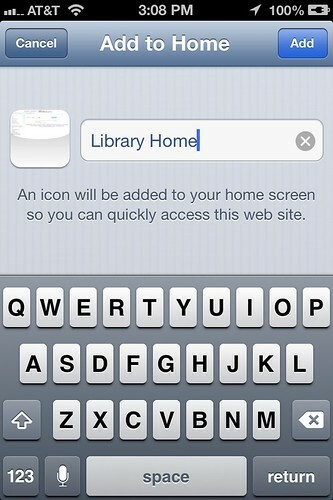 But it is a quick and dirty way to get your library page on their device without actually creating an app. Most medical librarians do not have the programming ability, time, or permission to create an app for the library site. When patrons come in looking for an app to the library page I would argue they are just wanting a little square on their device’s “desk top” for easy access to the library. Which is a lot easier than memorizing a website. I agree the site should be formatted for mobile devices. But again we run into the very real practical problems that most hospital librarians face when it comes to their library websites. Many HAVE NO CONTROL over anything more than the content. Many hospital require their departments to use a specific software or content management system to maintain their pages. 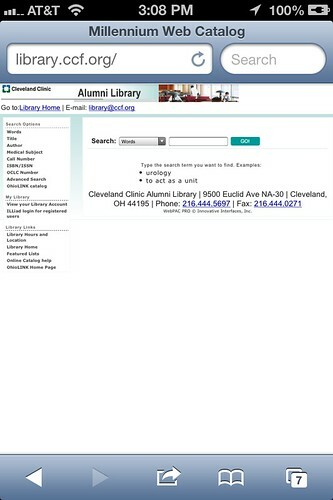 Depending on the CMS hospitals can also control whether your library even can have a mobile site. There are tricks to making a mobile friendly website without programming it as a mobile site, but hospital librarians are really dependent on their IT department’s permissions. 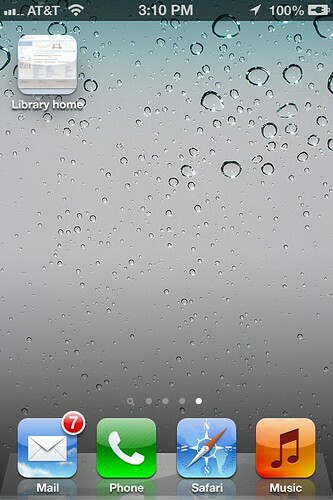 If a library has LibGuides, then they are fortunate because Libguides already formats things to be mobile friendly. I would also say that mobile friendly is more important for the use of cell phones than tablets. As long as you aren’t using flash, tablets often display traditional websites quite well. More and more doctors are using iPads in the hospital, so I am all for getting some sort of icon (regarless of whether it is a bookmark or a real app) front and center on their device reminding them of the library.